Teamed in only two movies and only slightly, but very purposefully, were the actors Cary Grant and George Winslow. Having been seen on Art Linkletter’s People Are Funny television show, the 6-year-old George apparently so delighted Mr. Grant for George’s seemingly natural talent for comedy (not to mention a child’s voice so uncharacteristically deep to have earned him the nickname Foghorn) that Mr. Grant recommended George for the role as the youngest child in the Cary Grant/Betsy Drake vehicle Room For One More (1952). 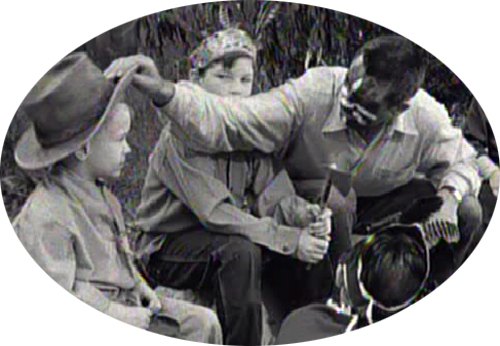 Later that same year they returned to the screen in Monkey Business (1952) in a brief scene giving George the role of wise mentor to a childlike Cary (adorned in warpaint) in need of advice on how to scalp a man.